Rent a car with total protection. Select a branch office Cancun Airport. Cancun Crown Paradise Hotel. Cancun Downtown. Cancun Hotel Zone Plaza Flamingo. Colima Airport. Colima Downtown. Guadalajara Airport. Los Cabos Airport. Merida Airport. Mexico City Airport. Mexico City Airport T1 International. Mexico City Airport T1 Nacional. Mexico City Airport T2 Nacional. Monterrey Airport. Playa del Carmen. Tulum. America Car Rental guarantees the best car rental experience in the top tourist destinations in Mexico: Cancun, Playa del Carmen, Tulum, Mérida, Los Cabos, Monterrey, Guadalajara and Mexico City (CDMX). We offer competitive rates, a variety of cars and vans in perfect condition in appearance and mechanically, were located in the major cities throughout the country, as well as professional and attentive service so you may feel at ease when out of town. We have over 20 years’ experience in the car rental business. Enjoy fully and comfortably the most popular destinations in Mexico in one of the many brand new vehicles for rent. No matter what your reason for visiting, nor the destination you choose, in America Car Rental we offer very low and very competitive rates compared to other car rental agencies. We offer a wide range of options for you in terms of cars vans shuttles or suvs for your business or pleasure necessities. We are positive you'll find the vehicle that best suits your needs. We have the perfect vehicle for you! Allow us to provide a swift and efficient car rental service at our America Car Rental in the many tourist destinations and most important business locations in México. One of the biggest benefits of renting a car or a van when your on a business trip or on vacation is that you'll be able to fully enjoy at your own pace all the places of interest, attractions sites of any of the destinations you visit, or simply getting around quickly, comfortably and securely day or night. 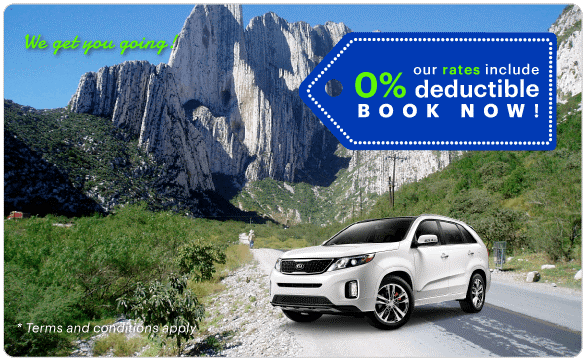 When renting a vehicle in Mexico Consider why America Car Rental Is your best option: We offer competitive rates for all vehicles in any of the cities you travel to; you will find the vehicle that best suits your necessities and price range, rates include unlimited mileage as well as insurance and taxes.